We’re proud to announce that our client, Boxed, won the NEXTY Award for Best Use of Data in Marketing. The NEXTY Awards recognize some of the most innovative marketing performances in the retail industry. Boxed first partnered up with Movable Ink in 2016, and since then, we’ve been working together using customer data and website behavior to shake up the world of wholesale shopping. Boxed campaigns blend CRM and contextual data to send hyper-personalized content and product recommendations. With Movable Ink’s Stories, they’re able to target any email with the most up-to-date behavioral content. One of their most successful campaigns displayed a “Recently Viewed” category banner that was personalized based on each customer’s real-time web activity. Movable Ink helped automate up to 5 different categories based on the 30-day website behavioral history of each specific customer, with creative that updates on the fly. 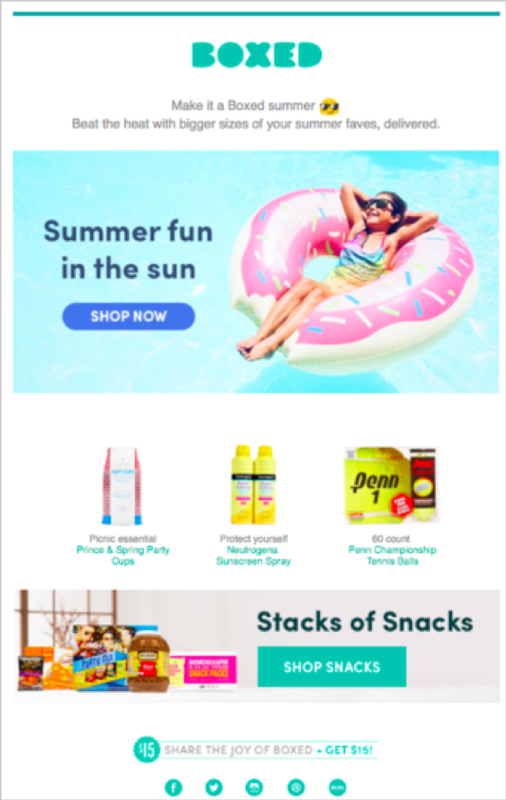 By showing category-specific messaging, Boxed was able to provide a better user experience that leads to higher click-throughs and conversions from their emails. The hyper-personalized content led to a massive 676% increase in CTR. And to top it off? Their team was able to save valuable time in their production process and could use one code of HTML to serve up five creative variations to different customers. This entry was posted in Content Marketing on July 24, 2018 by Carine Alexis.